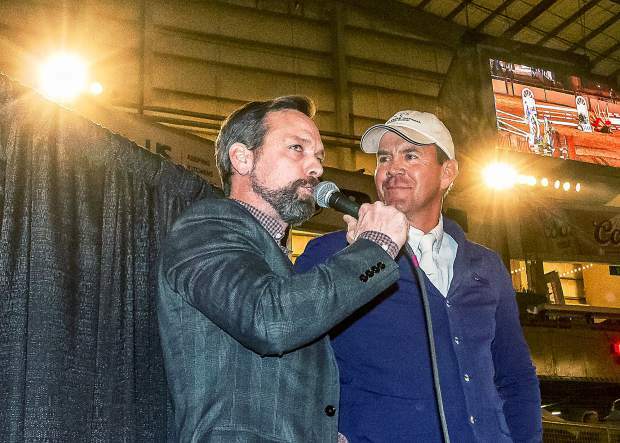 Event Announcer Brian Lookabill from Lexington, Kentucky interviewed 2015 Gambler's Choice Campion Matt Cyphert of Dallas, Texas, before the event. Cyphert said that he looked forward to coming to the Stock Show and jumping for the knowledgeable and enthusiastic fans. 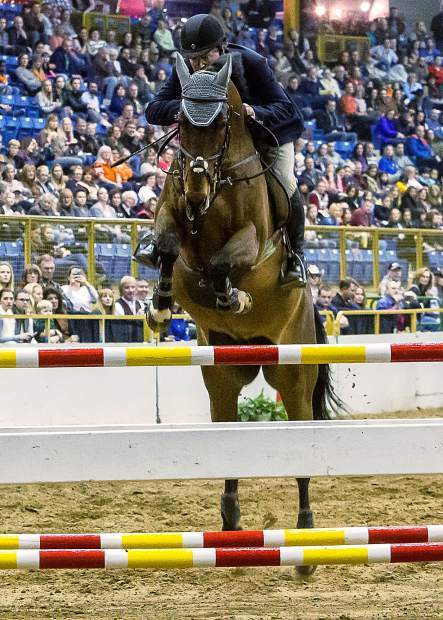 Kristin Hardin of California guides Cornell de Muse, owned by Nicole Teague, over a seventy point parallel oxer at the Monarch Casino Gamblerâs Choice Jumper Stake during the 110th National Western Stock Show. Hardin's 920 point total on Cornell de Muse was good enough for first place. Local favorite John McConnell of Colorado and La Belle Soiree owned by Molly Precourt of Edwards, Colorado, lift over a 50 point fence on their way to a very respectable 840 run and third place at the Monarch Casino Gamblerâs Choice Jumper Stake during the 110th NWSS. Paul Andrews (left) President and CEO of the NWSS, and Craig Pleva (right) General Manager of the Monarch Casino in Blackhawk, Colorado, congratulate John McConnell of Colorado for his 840 point run and Third Place on La Belle Soiree at the Monarch Casino Gamblerâs Choice Jumper Stake during the 110th NWSS. Kristin Hardin of California easily takes Bert, owned by Emily Cohodes, over one of the more difficult fences to score an 880 at the Monarch Casino Gamblerâs Choice Jumper Stake during the 110th National Western Stock Show. Hardin's run on Bert was good enough for second place. 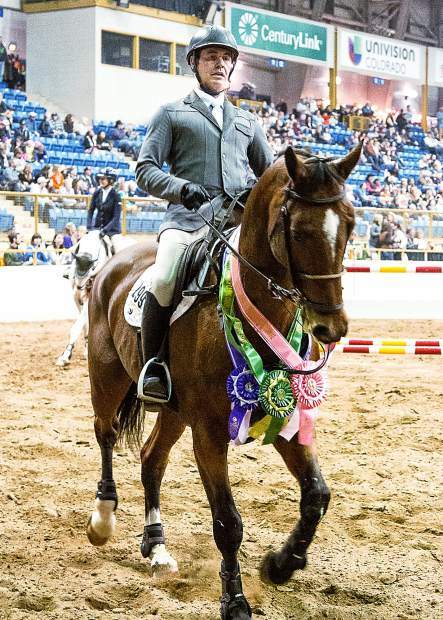 Cristian Heineking, a past winner of both the Gamblerâs Choice and the Grand Prix at the Stock Show, was perhaps the busiest rider at the Monarch Casino Gamblerâs Choice Jumper Stake during the 110th NWSS. 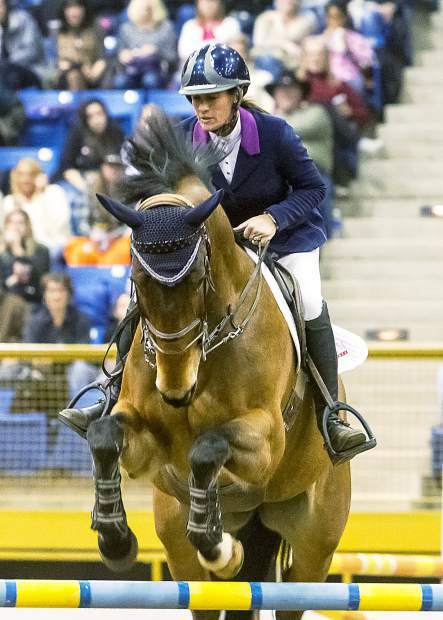 Heineking jumped four horses and took home three ribbons. Paul Andrews (left, brown coat) President and CEO of the NWSS, and Craig Pleva (right) General Manager of the Monarch Casino in Blackhawk, Colorado, present the First Place awards to Kirstin Hardin for her 920 point run on Cornell de Muse at the Monarch Casino Gamblerâs Choice Jumper Stake during the 110th NWSS. Kristin Hardin of California is all smiles after winning First and Second Place ribbons at the Monarch Casino Gamblerâs Choice Jumper Stake during the 110th National Western Stock Show. Course Designer Peter Grant of Canada set a challenging course that brought out the best in both horse and rider. Grant is a top level Course Designer certified to design courses for Olympic events. Denver loves a horse show. That was true in 1907 when the fledgling “Western Livestock Show” had its first horse show and it was just as true 109 years later when the 110th National Western Stock Show held the $10,000 Monarch Casino Gambler’s Choice Jumper Stake show. The National Western Stock Show has a wide array of both amateur and professional horse events. 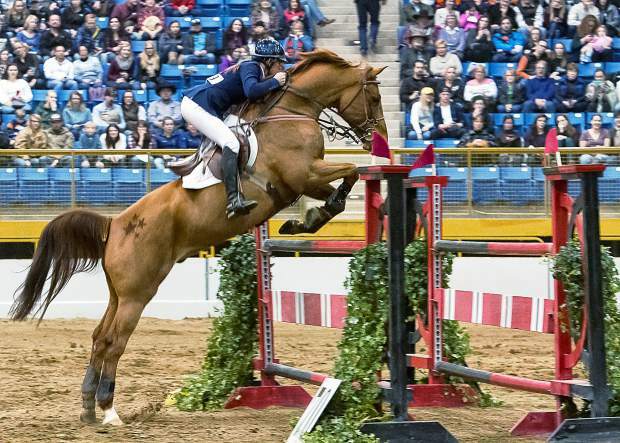 There are also two big prize money jumping events that are the hottest tickets in town. 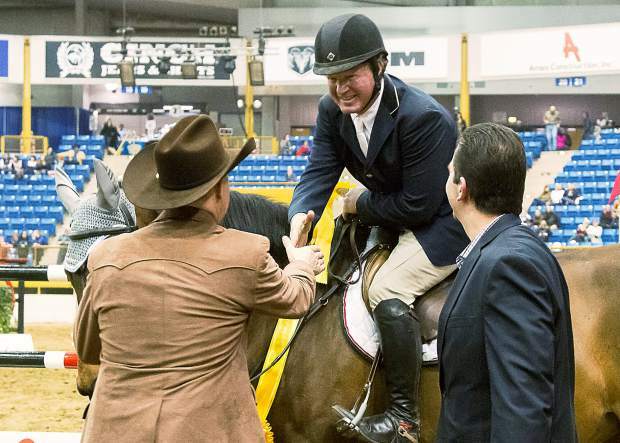 The $10,000 Gamblers Choice Open Jumper and the $40,000 Grand Prix are two of the most popular events at the Stock Show. They have a loyal and knowledgeable fan base and attract top riders and horses from across the country. 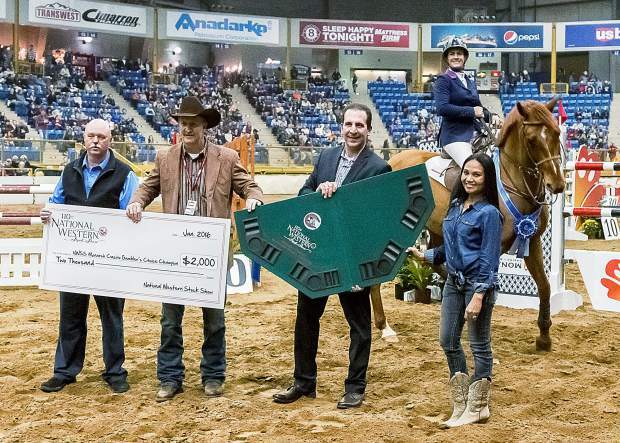 This year, the Gambler’s Choice attracted a new sponsor, the Monarch Casino in Blackhawk, Colo.
McConnell was new to the horse show side of the NWSS this year after working the back side of ticketed events for many years at the show. 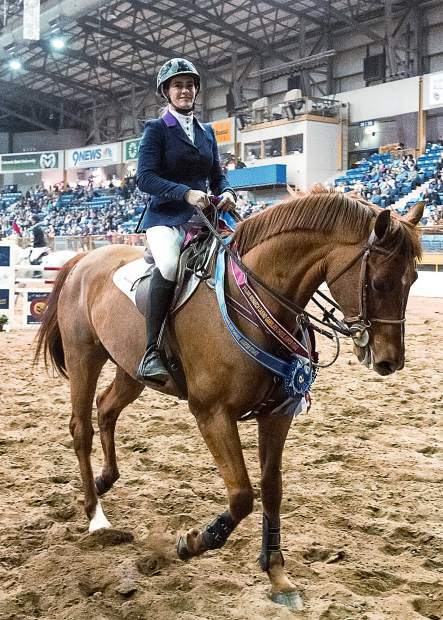 She rides and shows Arabians on the National Circuit, representing her family’s Arabian farm north of Berthoud, Colo. 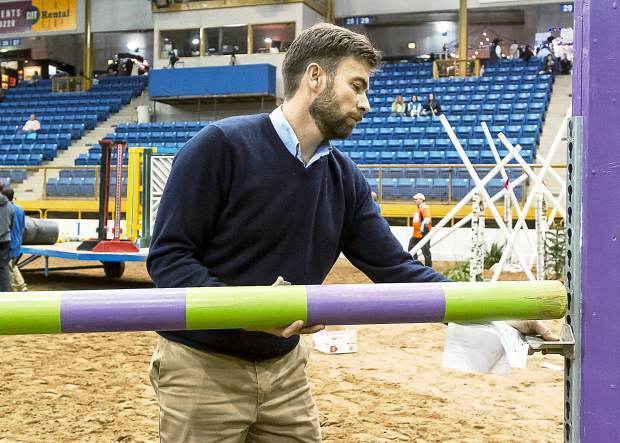 The Stock Show also brought in a brand-new course designer, Peter Grant from Canada, for the show. “Our Course Designer this year is (International Federation for Equestrian Sports) rated, which is the very high level show jumping federation. That means that he can design courses at the Olympic level. 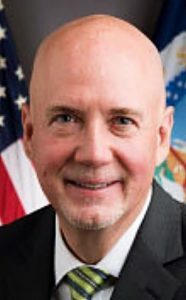 He came in highly recommended and does some interesting courses that really challenge the horses and riders.” McConnell said. Grant said his goal in setting the Gambler’s Choice course was to put on the most entertaining show possible. The exciting Gambler’s Choice has none of the structured formality of a Grand Prix event. The course has fences of various height, difficulty and points. They can be jumped in any order or direction. A single fence can even be jumped twice. At the end of the allotted two-minute time limit, the rider may elect to jump the Joker Fence. The formidable Joker is five and a half feet tall (or in hunter/jumper speak, “a meter fifty”), with close set rails. The Joker is worth 200 points for a successful jump and minus 200 for an unsuccessful attempt. The Joker fence is always a make or break point in the ride. It comes at the end of the two minute ride when both horse and rider are tired. The event may seem fairly unorganized, but it takes a lot of skill. The fans love it and performances are always sellouts. True to his word, Grant set a course that proved to be more difficult than courses set in previous years. There were quite a few top rails, including those on the Joker Fence, which rolled to the ground, much to the dismay of the riders. There were also some flat-out refusals by horses. None of that mattered to Kristin Hardin, a trainer from Santa Barbara, Calif. Hardin had a clean run for 920 points on Cornell de Muse, a horse she has in training. Bert, her own horse, ran a clean round for 880 points to come in second. “Cornell de Muse is a young horse and it was a big thing for him to go in there with the crowd and jump the Joker, but he is kind of one of those horses that the harder things are, the better he is,” Hardin said. She had to do different courses with each horse, because though they both jump cleanly, the have different strengths. Local favorite John McConnell of Colorado rode La Belle Soiree to a very respectable 840 point run and third place out of 27 entries in the event. Filling out the top five places were Nicole Peterson on Quantonius in fourth place and past champion Christian Heineking in fifth place on Casino.